In the United States, processed food products with added sugar and salt are often more affordable than nutrient-rich foods like fruits, vegetables, and whole grains. For this reason those of us with limited material resources find it easier to fill up on calorie-dense food that does not contain the varied nutrients our bodies need. 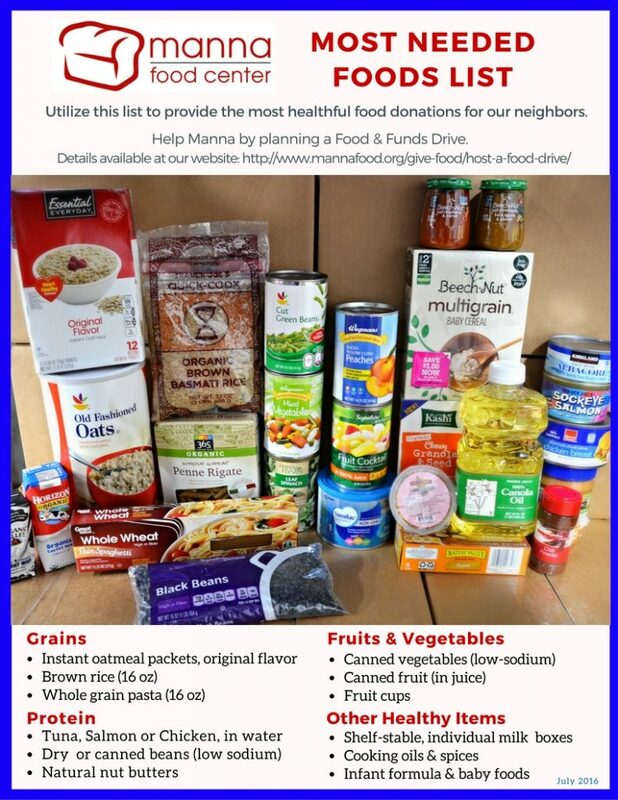 The Most Needed Foods List suggestions listed here will help guide you in providing the most healthful donation for our neighbors who need it most. Foods in sharply dented, swollen, bulging, leaking or rusted cans. Bulk foods that have been repackaged. Foods in containers without labels. Foods in opened or torn containers exposing the food to potential contamination. Foods with an “off” odor or foods that show any other signs of spoilage (browning, discolored, slimy layer). “Distressed” foods = foods that have been exposed to fire, flooding, excessive heat, smoke, radiation, other environmental contamination. Foods that have been recalled for potential health risks.